I have been taking a wee break from blogging due to it being that dreaded TAX time but as soon as I get all the returns completed (5 down, 2 to go) I will be back posting on both Tuesday and Thursday for Stampin' UP! plus my Design Team posts. Today I am bringing you a really fun card Design Team card I made using the Crafts & Me Digital Image by Robin Pushay named "Kisses for Mum" I am actually saving this to give my own mom on Mother's Day this year. I am sure she will love it. Here is little closer look of my coloring. I have colored her with Copic Markers. 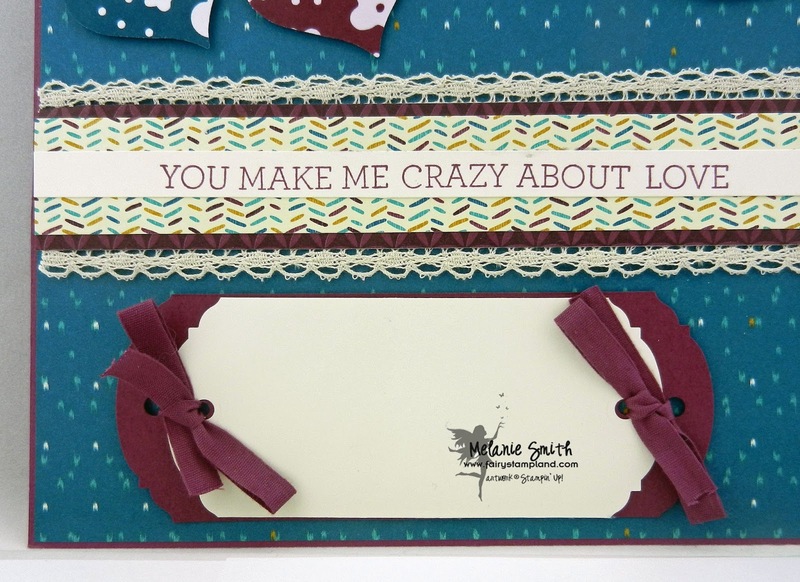 To participate in our online Facebook challenge over at Crafts & Me Facebook Page click HERE. Theme this 2 weeks is pastel colors but we always have an optional ANYTHING GOES so that makes it super easy to join in the fun!!! Hope to see you on Facebook. I'm Back...... After a Little Technical Difficulty! If you are a member of my email list (<<<< Sign up to the left so you do not miss a thing) Then you already know that when I went to post my Tuesday SU! Post and my card reader on my computer decided to die on me so I ran out of time to be able to post my Tuesday Inspirational Post :-( I have a new card reader ordered so hopefully I can get back to better photo quality real soon. 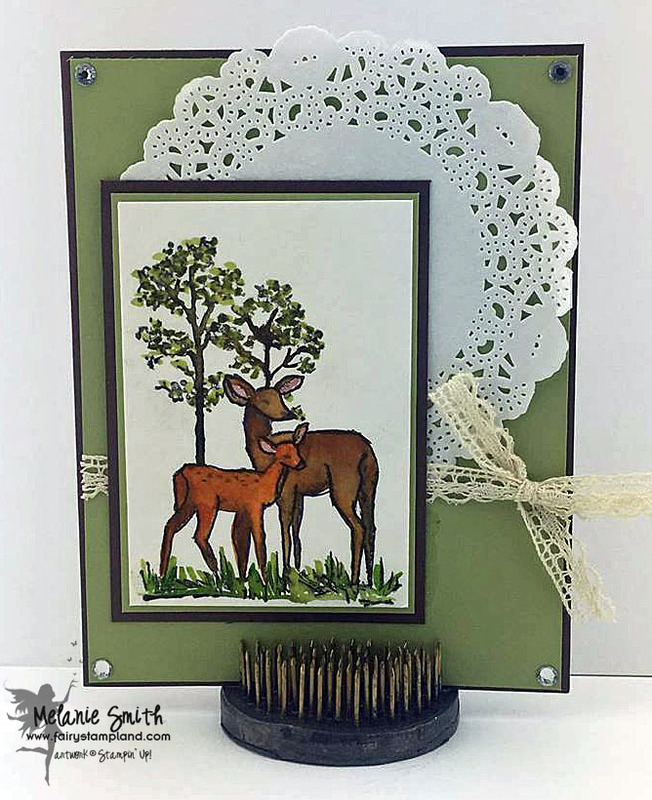 Today's card is one using blender pens and ink to create a beautiful water colored look. As a lot of you know I love coloring and it is so hard not to include coloring into EVERY project I create. This stamp NEEDED to be colored though, and I believe I got good depth and shading using this simple color technique. If you enjoy my work I would be honored for you to become my newest follower. You can simply enter your email where it says "Follow by email" to receive my blog posts directly to your inbox. Or choose to sign up for my newsletter which emails out once to twice a week. I'd love to keep inspiring you by keeping in touch! I have a beautiful clean and simple card to share with you that I am just extremely proud of. 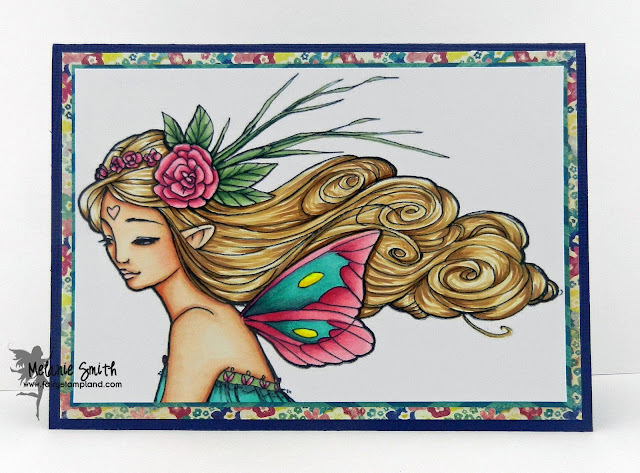 I colored this beautiful image from the Crafts & Me Store called "Rosewind". It is by illustrator Sara Burrier and isn't is just magnificent? After coloring it I just sat back in awe and decided that I would keep this design of the card simple to show off this amazing image. The Copic Color Palette for this project is as follows. If you would like to play along this week with us in the Crafts & Me Spring Is Coming Challenge please head on over to the Facebook Group to join along. We have an optional "Anything Goes" theme and would love to be inspired by your work. I am entering this photo as one showcasing a card. 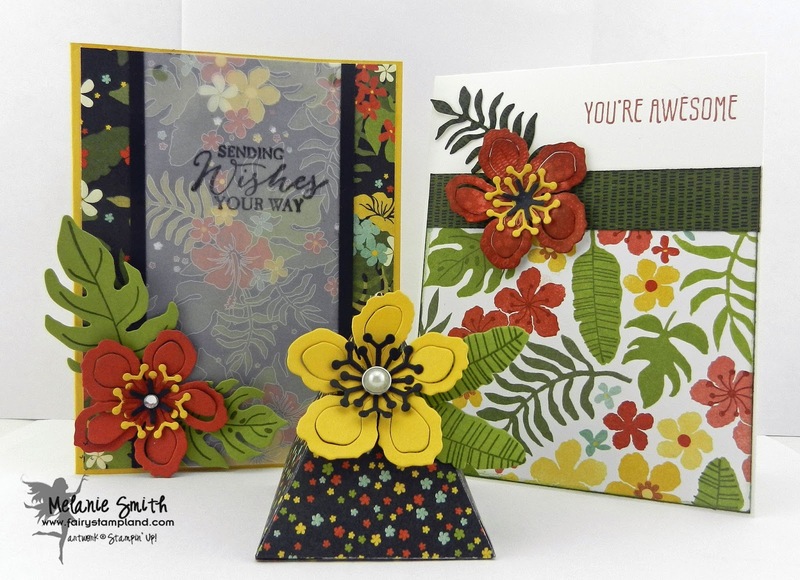 I used the Botanical Blooms Stamp Set, The Botanical Blooms Designer Series Paper, and the Botanical Builder Framelits Dies which are all bundled together for an amazing 15% off bundle price. (Item #140819) The sentiment on the first card came from the Butterfly Basics Stamp Set (Item #138813 wood or #138816 in clear mount) I stamped it onto the coordinating Botanical Gardens Designer Vellum Stack. 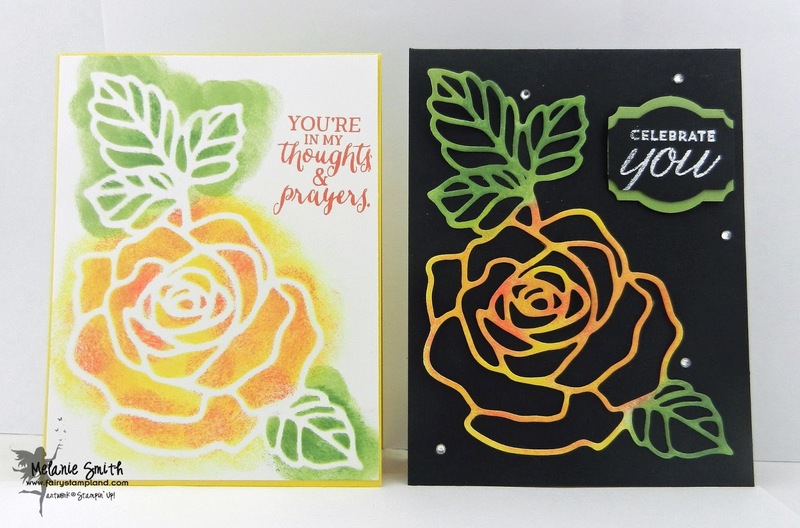 The sentiment on the right card came from the "Botanicals For you" set both of these coordinating items (Vellum & Stamp Set) can be earned for FREE during Sale A Bration with a $50 purchase for each item (Item # 141234 wood or #141237 Clear Mount and #141019 for the vellum) This entire suite of items is one of my very favorites from this years Sale A Bration. The Free Items will only be available until March 31st, 2016. 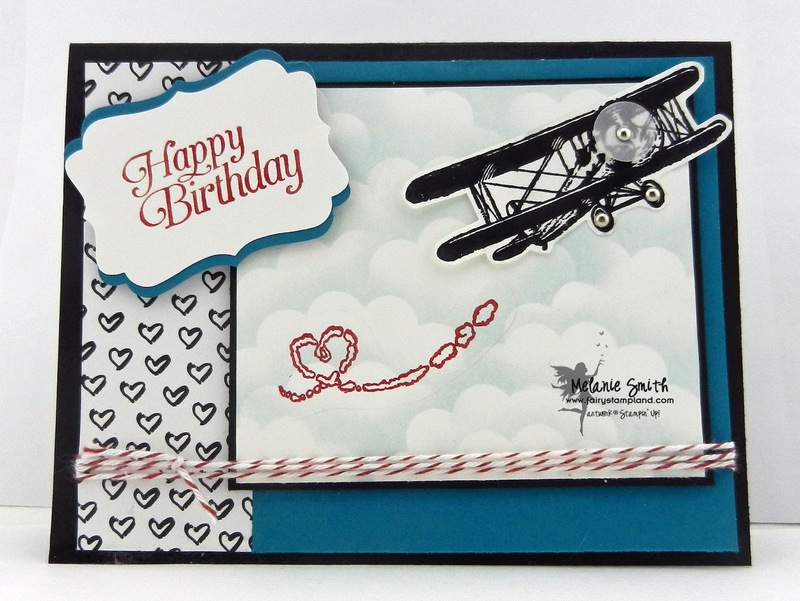 For card example #2 I choose this Masculine card because I am quite proud of how the clouds turned out. See back to my previous post HERE as to how to recreate them as well as seeing which items were used in this card. Lastly for card #3 I chose to share my most popular card so far during Sale A Bration using the AMAZING Rose Wonder Bundle available in the Occasions Catalog (Item #140804). I was planning on making only one card but card #2 happened by accident. You can read all the details HERE on my previous post. 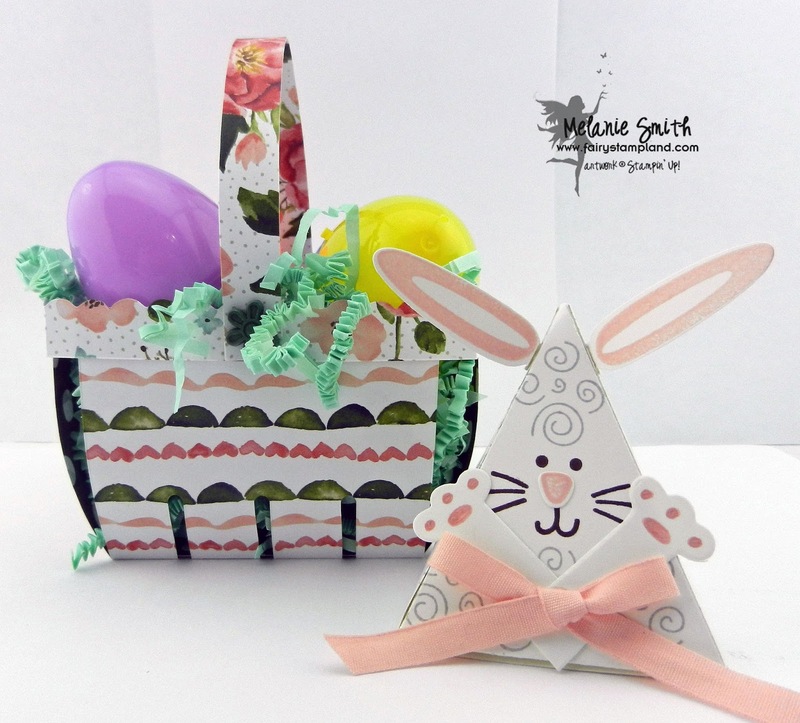 For my first 3D Project I chose Mr. Easter Bunny made as the Pyramid Pals Stamp & Die Bundle (Item#141069) I have used the Birthday Bouquet Designer Series Paper (Item #140557) for the basket using the Berry Basket Bigz L Die (Item #137366). this was actually the very first time using this die and it will surely not be the last. It was so much FUN! 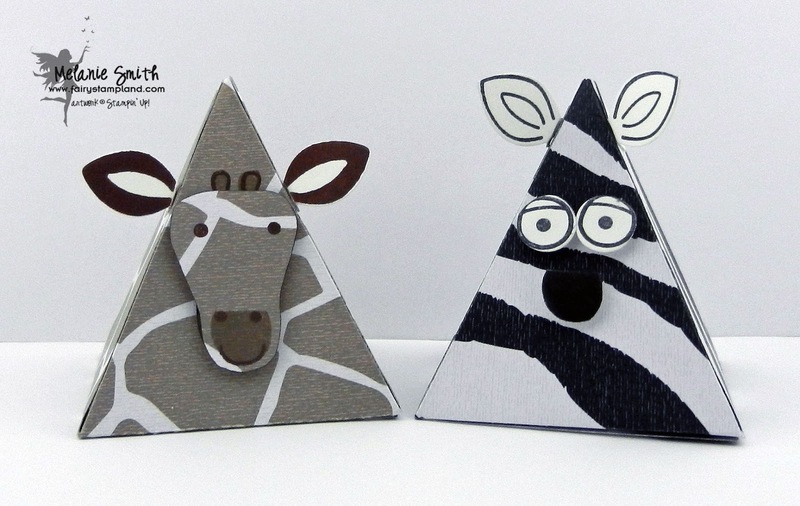 For my second 3D item I am sharing with you a set of refrigerator magnets also using the Pyramid Pals Bundle as referenced to above. This idea came from brainstorming with one of my downline members, Margaret. I had such fun with these little guys. 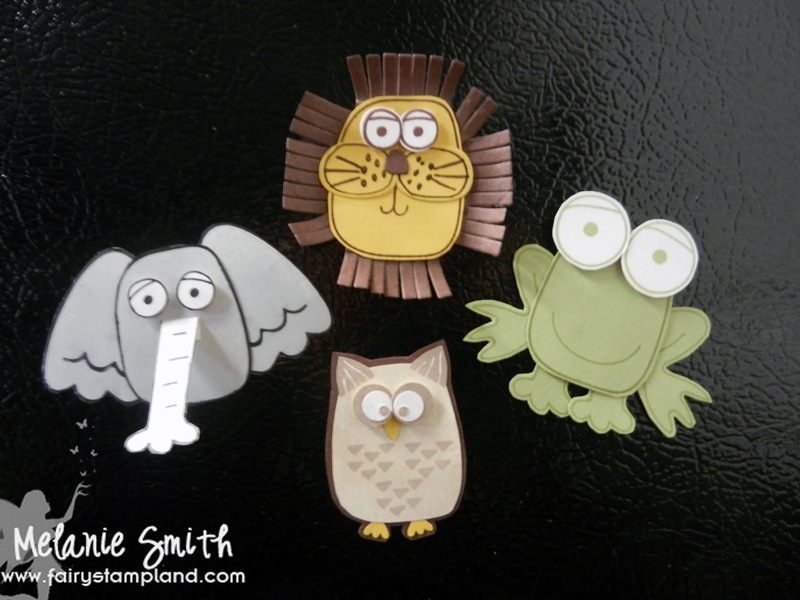 Especially the Owl as I used some of the piece from Stampin' UP! 's Owl Builder Punch for the feet, eyes and beak. Sorry for the glare of this photo but I wanted to show the Project Life overlay that I used over this photo of me. THIS IS ME saying to all of you in Stampin' UP! world out there that "I for one would be HONORED to be chosen for one of the On Stage Display Board Makers. I know back in July when I attended I absolutely was inspired by all the samples and would love to inspire others this year! Thank you for your time and for considering me for the position." Stampin' UP! Pyramid Pal Fun! 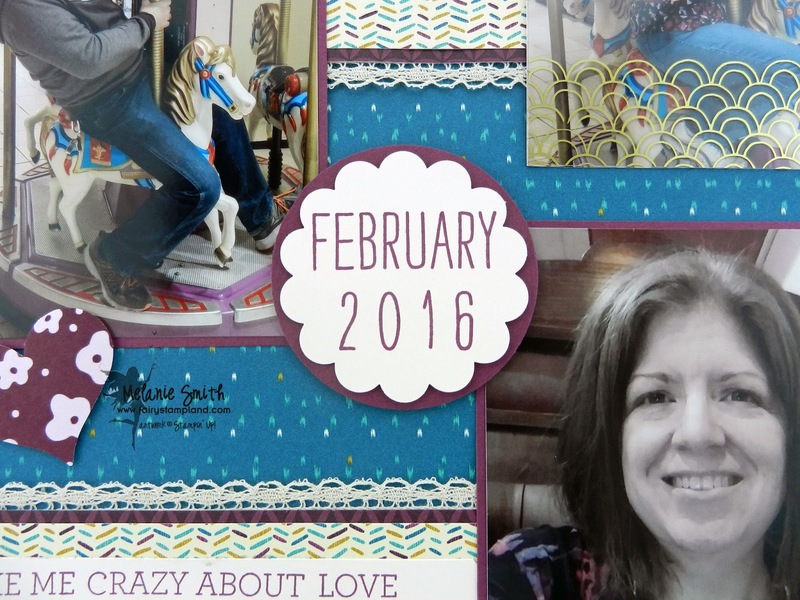 I was recently chosen by my Stampin' UP! 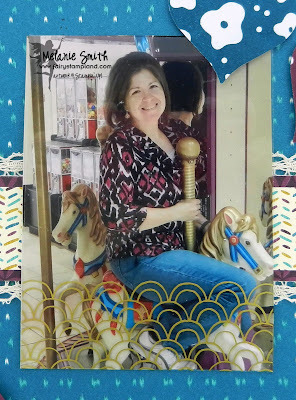 up line, Patty Bennett, to be a sample maker for our Luv 2 Stamp group using the Playful Pals Stamp Set & the Pyramid Pals Thinlits Dies set. (Bundle Set is 15% off, item # 141069) These can be found on page 44 & 45 of the Occasions Catalog. At first I was a little flustered and was not sure how I could make 6 different samples using the same set as I wanted each to be a little different. Once I began playing with the set though I became addicted to them. 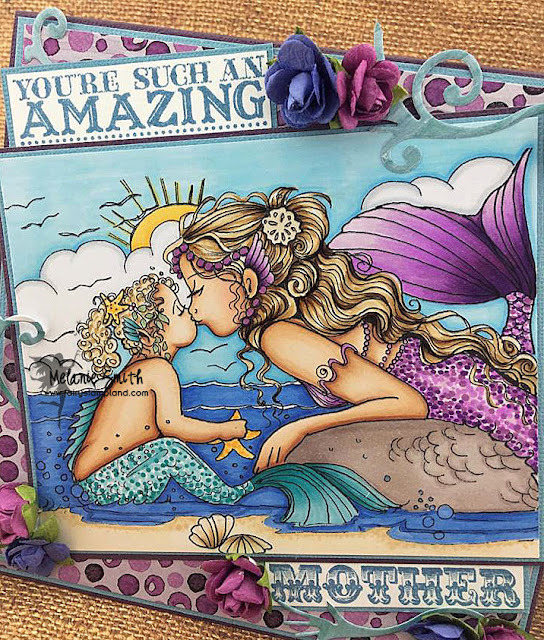 My Fairy Land Stampers team of demonstrators helped me brainstorm a little and the rest was history. 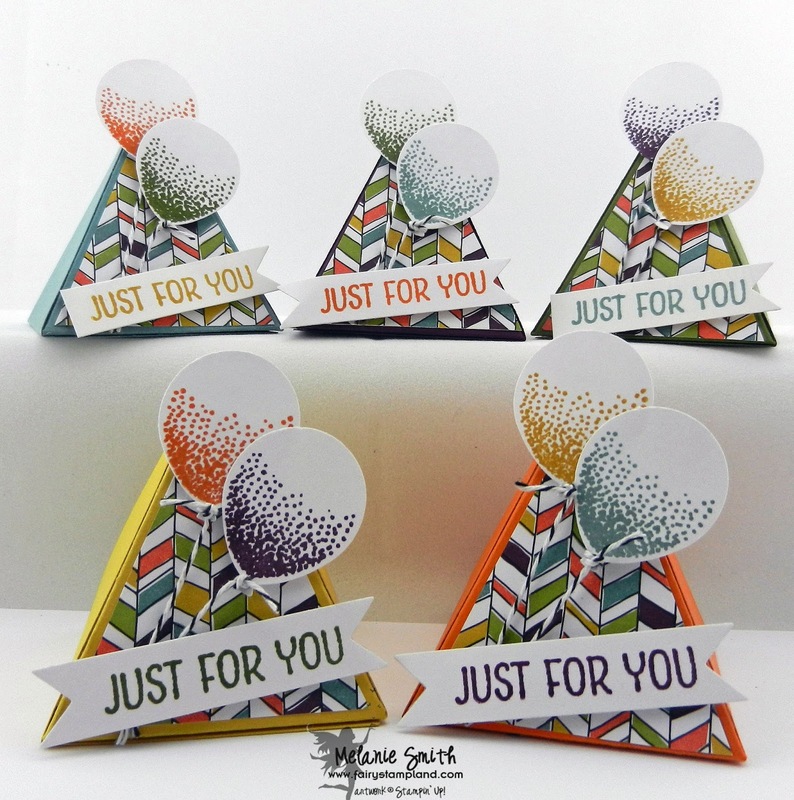 Today I am sharing with you 3 sets of Pyramids I made with the fascinating set and then on Thursday I will be back with 3 other samples along with a fun announcement. 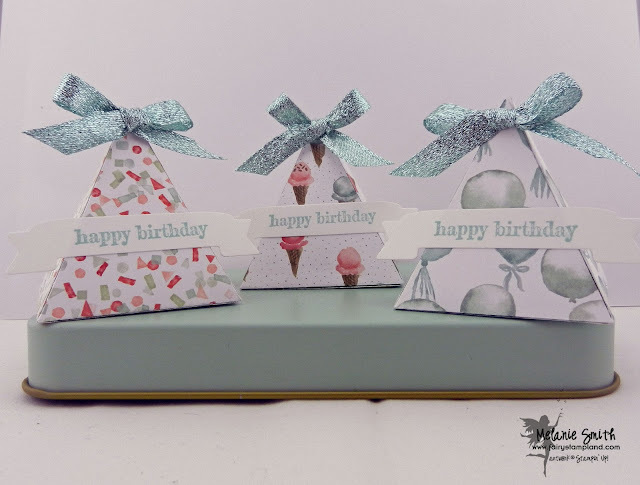 You can never go wrong with birthday party favors so I decided to use just the pyramid box framelit for these adorable party treats. The backs of the pyramids open so candy can be tucked inside. I have used the following items from the Occasions Catalog to create these. Birthday Bouquet Designer Series Paper (Item# 140655), Pool Party 3/8" Glitter Ribbon (Item # 140561 - Love this stuff!! 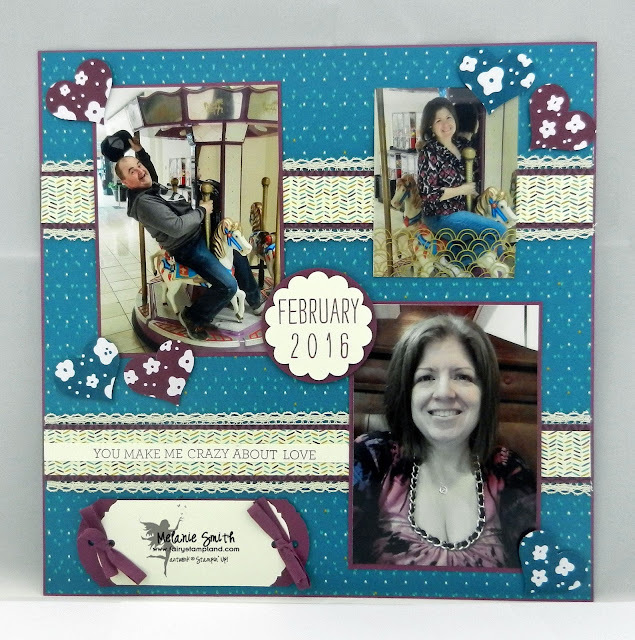 ), The Large Numbers Framelit Dies for the banner cut out (Item# 140622), and lastly the sentiment set actually came from a sentiment set in the Annual Catalog called " Something to Say" It is a great go to set to have in your stamp collection. Lastly I think this is the my favorite of the 3 pyramid sets here. This one is "Just For YOU!" I want to thank everyone of my readers for all of your support in helping me grow my business. Without readers, and shoppers of course, I would not be where I am at today. The support means the world to me. I wish I could meet each and everyone of you in person and stamp with each of you. 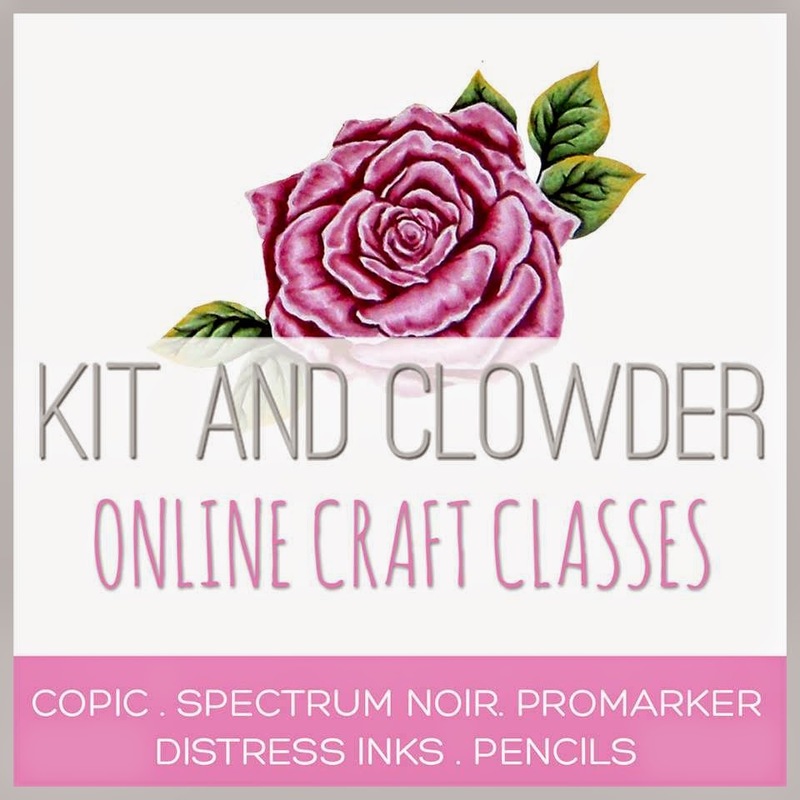 Thank you for stopping by today...Check back with me on Thursday for the rest of my Sample Maker projects.